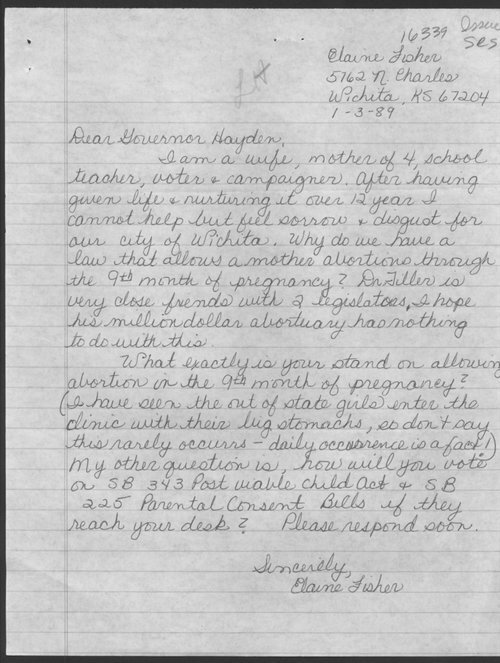 Elaine Fisher of Wichita, Kansas, writes Governor Mike Hayden of Topeka concerning late-term abortions. Fisher expresses her disapproval of late-term abortions and her support for state legislation outlawing such procedures. She suggests that Dr. George Tiller's clinic in Wichita is a very profitable business and may unduly influence state lawmakers' decisions on abortion. Fisher further claims that out-of-state girls in their ninth month of pregnancy visit Dr. Tiller's clinic on a daily basis. She asks for the governor's position on two bills before the state legislature: the Post Viable Child Act (S.B. 343) and the Parental Consent Bill (S.B. 225). Fisher enclosed an anti-abortion circular with her letter. The 1973 U. S. Supreme Court decision in Roe v. Wade confirmed a woman's constitutional right to terminate her pregnancy and limited the restrictions states can impose on abortion. Call Number: Governor's Records, Hayden, Box Constituent Subject Files, 1989, Folder "Parental Consent"